Escaped Chibok girl Amina Ali Nkeki says she misses her Boko Haram fighter husband and is still thinking about him three months after escaping in miliant camp. 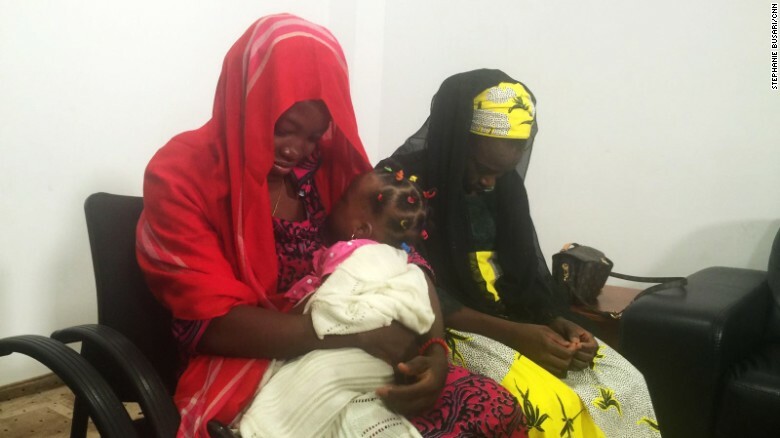 Amina Ali, who was held hostage by the terrorist group for more than two years, says she was married off a year into her ordeal and later had a baby girl, Safiya. The couple and their daughter were found on the outskirts of Nigeria's Samsia forest in May. She says they fled the camp by them selveand were not rescued by the Nigerian military, contrary to reports. Her husband, identified as Mohammed Hayatu at the time of their escape, told a witness that he too had been kidnapped by Boko Haram. He was placed in military detention for interrogation by Nigeria's joint intelligence center. 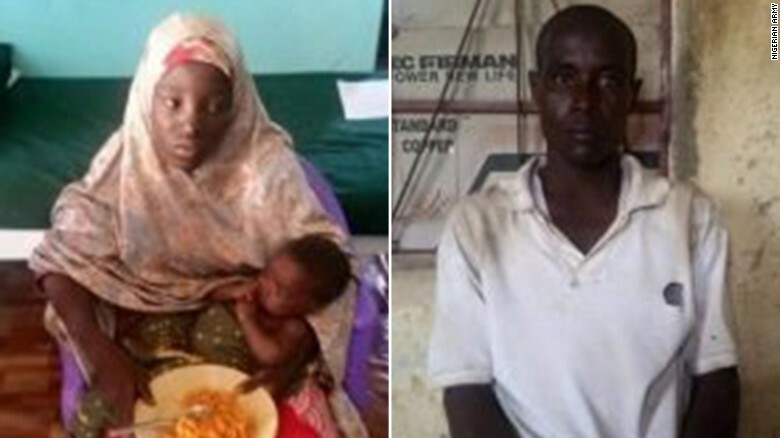 Amina Ali was found with a suspected Boko Haram terrorist named Mohammed Hayatu. Amina Ali says she has no idea where he is now and is keen to be reunited with him. "I'm not comfortable with the way I'm being kept from him," the painfully shy 21-year-old told CNN in her first worldwide interview, at an undisclosed location in Abuja Tuesday. Addressing the father of her child directly, she says: "I want you to know that I'm still thinking about you, and just because we are separated doesn't mean I have forgotten about you." Her statements came two days after the terrorist group released a grisly video showing the dead bodies of young women, taken in the aftermath of what Boko Haram says was a Nigerian airstrike. Amina Ali says a dozen captives died in a bombing more than a year ago, which suggests that the footage is not new, according to a spokesman for Nigeria's National Security Advisor. 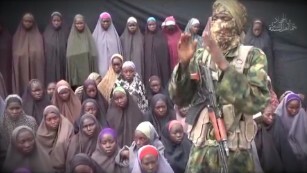 The video also shows a Chibok girl reciting a scripted plea for the release of Boko Haram fighters in exchange for the kidnapped girls. Amina Ali was one of 276 schoolgirls abducted at gunpoint from their boarding school in Chibok in April 2014, by Boko Haram fighters. As many as 57 girls were able to escape almost immediately, but more than 200 remain missing. The kidnapping sparked global outrage and prompted global figures, including activist Malala Yousafzai and first lady Michelle Obama, to support the campaign to #BringBackOurGirls. Amina Ali refuses to talk about the attack, saying only she cannot remember what happened that fateful day. For a year after they were taken, the abducted girls were kept together, she says. Then some of the teenagers -- including her -- were "given" to the terrorists as wives. 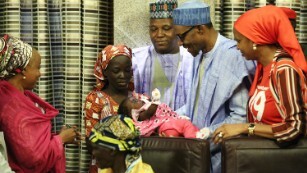 Chibok girl Amina Ali Nkeki (in red), who was kidnapped by Boko Haram, with her baby daughter. She says she was desperate to see her mother again and that the thought gave her the courage and strength to flee the camp. Asked how she felt about becoming a mother herself while in captivity, her face clouds over and, speaking through an interpreter, she insists: "I don't want to answer." Her mother has spent the past two months staying with her in the capital. But Amina Ali has still not been back to Chibok and says she wants to go home and return to school. "I'm not scared of Boko Haram. They are not my God," she said. The whereabouts of the rest of the girls remain a mystery, though they are believed to be somewhere in the Sambisa Forest, a Boko Haram stronghold in the country's northeast. The current Nigerian government has said via Facebook that it is in touch with Boko Haram and working to secure the girls' release. Over the past two years, successive Nigerian governments have been criticized for failing to recover the young hostages. "It's one of those rather child-like situations that if you shut your eyes, if you don't exhibit the tactile evidence of the missing humanity here, that somehow the problem will go away," he said. Amina Ali remains the only long-held hostage who has escaped. But she has a defiant message for her "sisters" still being held: Don't lose hope. She managed to get away, she says, and one day they will be able to return to their families too. "Be patient and prayerful," she said. "The way God rescued me from Sambisa Forest, he will rescue you too."